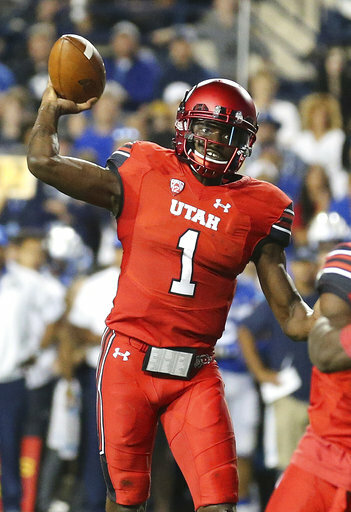 PROVO (AP) — Utah quarterback Tyler Huntley combined for 389 total yards and a touchdown as the Utes beat rival BYU 19-13 on Saturday night. The victory was the seventh straight in the series for Utah (2-0) and 16th in the last 19. Huntley did everything but block for the Utes’ offense as he finished with a career-high 300 passing yards and 89 rushing yards. He continues to give up on the pass a little too often, but the dual-threat consistently makes plays in Utah’s new pass-first, spread system. 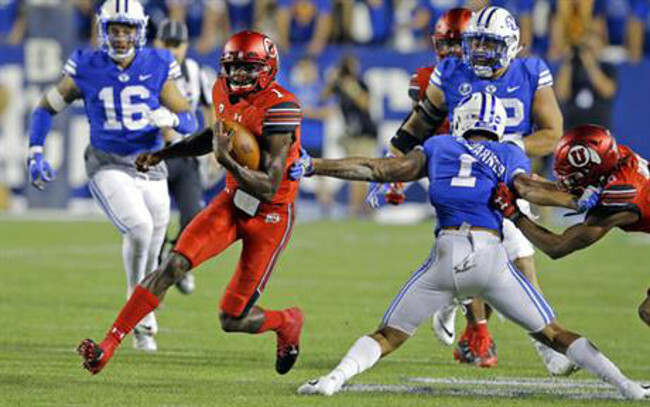 Utah reached the red zone seven times, but settled for field goals on four of those trips. The final trip ended in kneel-downs to end the game. Darren Carrington led the team in receiving for the second consecutive week with seven catches and 129 yards. 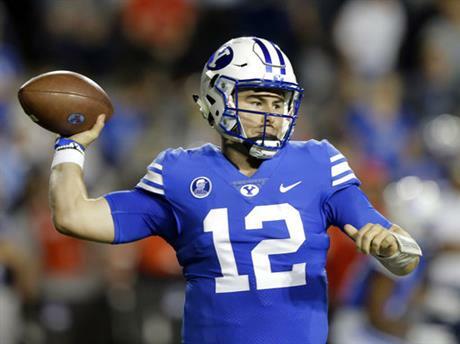 The BYU (1-2) offense continued its early season struggles with turnovers and penalties killing any momentum. Tanner Mangum was 21 for 39 with 170 passing yards, one touchdown and three interceptions. The Cougars didn’t have much luck during the game — one of the interceptions was tipped by defensive tackle Lowell Lotulelei right into the gut of defensive end Filipo Mokofisi — but they still couldn’t move the ball. Mangum threw a 7-yard touchdown to Trey Dye to cut the lead to 19-13 with 2:38 remaining, but it was too little, too late. BYU got the ball with a chance to win the game down by six points and 1:34 left in the game, but turned the ball over on downs before the Utes ran the clock out. Utah opened the scoring with a 21-yard field goal. The Utes returned an interception to the BYU 9-yard line before settling for a 3-0 lead nine minutes into the first quarter. With 9:36 left in the first half, Rhett Almond missed a 28-yard Cougar field goal to the left. Primed by a 48-yard pass play, Utah made its second field goal, this time from 25 yards out, to lead 6-0 with 6:02 on the second quarter clock. The Utes hit their third field goal as the first half clock ran out for a 9-0 lead heading into the break. 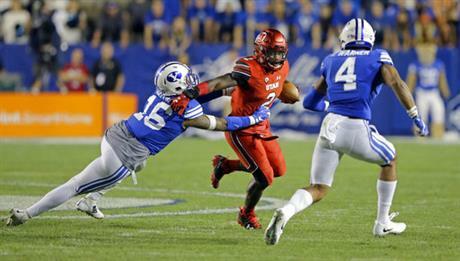 Following another BYU interception, the Utes scored the game’s first touchdown early in the third quarter. Quarterback Huntley ran 5 yards to cross the goal line and put Utah up 16-0. Tolutau gave BYU a touchdown with 9:47 on the third quarter clock. After Fred Warner recovered a fumble on the Utah 22-yard line, Tolutau had four rushes for 22 yards on the drive. The Cougars failed on a two-point conversion attempt to trail 16-6. The Utes’ fourth field goal, a 38-yarder, came with 2:35 left in the third quarter and put Utah up 19-6. Mangum led BYU on an 11-play, 76-yard touchdown drive late in the fourth quarter. He found Dye in the end zone for a 7-yard touchdown pass with 2:38 on the clock to cut the Cougar deficit to 19-13. BYU was able to get the ball back with under two minutes to play, but failed to get a first down to extend the game. UTAH: The victory won’t help the Utes much as far as the rankings go, but beating your rival is always a positive. Penalties remain an issue and Huntley accounted for more of the run game than the coaching staff would like. 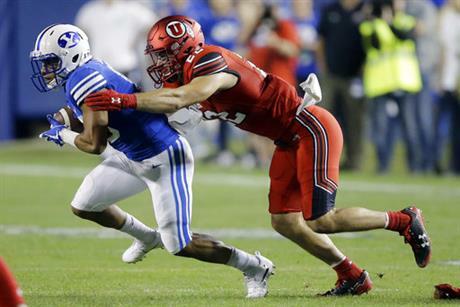 The rivalry game is often a toss-up regardless of who’s the better team on paper, and Utah is now set up for a 3-0 start heading into Pac-12 play in two weeks. 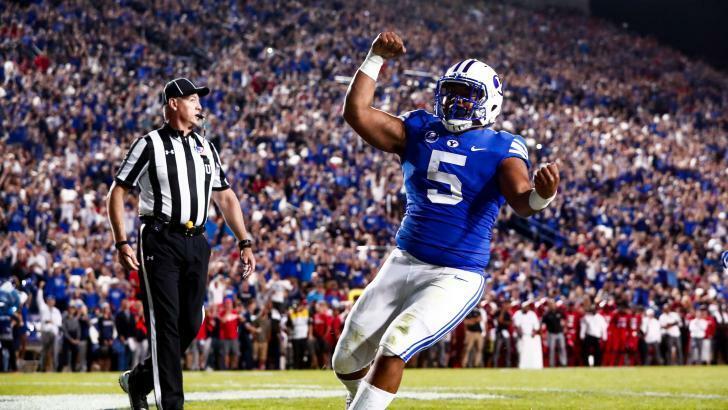 BYU: The Cougars scored their first touchdown in eight quarters and the first in 23 drives. The run game managed just 63 yards after being held to negative-5 yards last week. 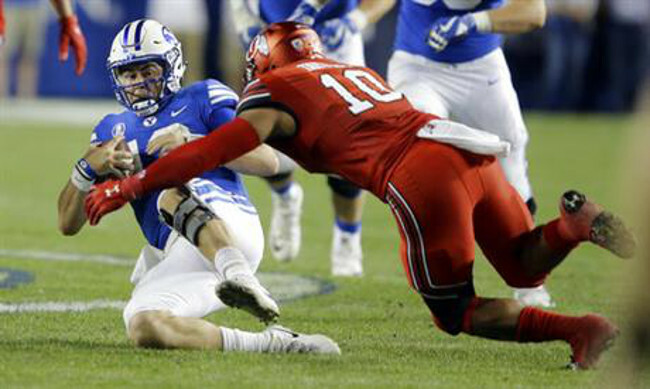 Sitake called for changes after being shutout last week and it’s unlikely he’ll feel much better this week. Utah returns to Salt Lake City when it hosts San Jose State on Sept. 16. BYU plays its third straight Power 5 team when it hosts No. 9 Wisconsin on Sept. 16. 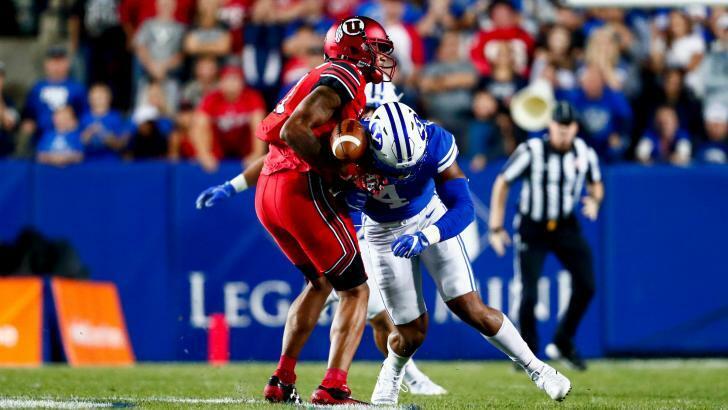 The Utes dominated this game but the refs were the equalizers. Questionable calls took away countless yards and one touchdown. The questionable offensive interference call on Wilson took away a Carrington TD. A horse collar on Moss was overlooked. The worst call though was the fumble by Mangum which was ruled an incomplete pass but the weirdest call was holding on the QB Huntley. A clear PF occured after the whistle on Carrington. The score should have been 40 to 13 had the refs been better. What ward were these refs from? There are always a few bad calls but they are usually distributed between both sides. Not this night.